Interested in understanding battery system project risk and how to assess it? Please join me in Las Vegas on December 7th for a 4-hour, PDH-eligible course at 2015 Renewable Energy World. I recently revised the Hierarchy of Battery System Design. This short series explores each level through one or more examples. Read about Level 1, Level 2, Level 3, Level 4, and Level 5 systems. A simple battery system is comprised of battery cells plus a management system. The big innovation of Level 2 is introducing a battery management system (BMS) with simple control loops that senses specific outputs from within the battery system and alters performance using a limited set of actions. 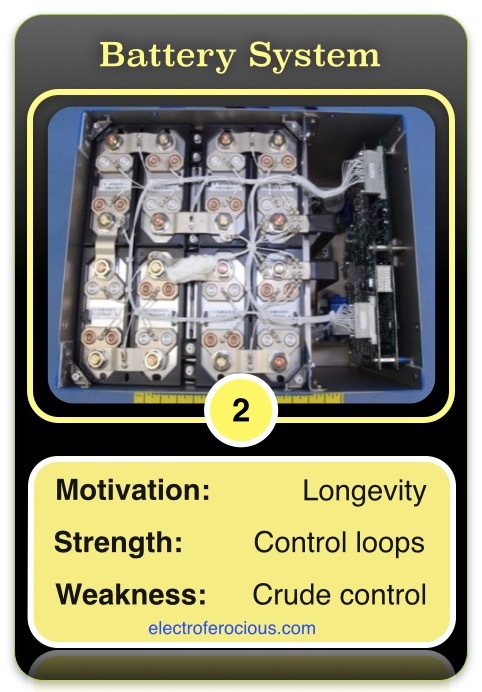 The control loops are necessary in order to increase the safety and longevity of battery systems constructed with advanced battery cells such as Lithium ion. Level 2 battery systems enjoy improved longevity and safety as a direct result of the addition of a battery management system to improve battery system performance. The control loops of a Level 2 BMS recognize two states, Good-Bad. When a Bad state exists, the battery system is placed in a non-operating and/or degraded state with the intent to halt a potentially damaging situation and preserve the battery system for use at a later time. As you might imagine, this approach causes problems when the system is part of a vehicle in motion or integrated into a renewable energy system that is contracted to provide ancillary services or power and energy to a schedule. When the Kahuku Wind Farm on the island of Oahu, Hawaii went into service in 2011, it did so with an advanced Lead acid battery system as an integral part of the project. In Months 2 and 3 of the the project’s operations phase, battery system fires interrupted operations. A final fire, in August 2012, led to a $30 million loss and operations were halted for 18 months until a new (non-battery) technology could be put in place. The battery system developer indicated that the fires all started with the inverter technology used in the battery system project. Level 2 battery systems typically displace battery management system construction and/or risk to a third-party player by engaging a third-party developer or a commercial off-the-shelf (COTS) battery management system. This third-party approach segregates battery management risk from the battery system developer. When looking for information about the battery management system for Kahuku Wind Farms, it is evident that the inverters were custom electronics specific to this advanced Lead acid battery technology. Changes were made, at the direction of the battery system developer, to the inverter’s construction and functionality to accommodate the advanced Lead acid batteries. Insurance industry player Lloyd’s of London paid out claims in excess of $2 million dollars for multiple claims as a result of the Kahuku Wind Farms battery system fires. Subsequently, certain underwriters filed suit against companies associated with the construction and supply of the inverters for the Kahuku Wind Farm battery system. The Underwriters’ lawsuit against companies other than the battery system developer could be taken to indicate that the segregating BMS risk approach has validity. My opinion is that that these types of lawsuits will evolve as the insurance industry’s involvement with commercial battery system projects expands. 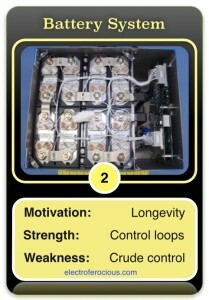 A Level 2 battery system can do well in applications which are simple (such as an off-grid street lamp which discharges overnight and charges during the day) and/or that are tightly constrained to a few known states, especially when unknown states typically mean a loss of the entire application so the battery system functionality during such states is not mission-critical (such as a satellite). The concept that battery system developers are in the best position to manage battery management system design and implementation distinguishes a Level 3 battery system from a Level 2 system where subsystems of the battery system are treated as interchangeable parts. Due to the complexity of the electric grid and the limitations of a Level 2 BMS, a Level 2 battery system is unsuitable for a utility-scale applications. (b) the desire to include entire subcomponents of the battery system design in the risk mitigation strategy to unlock bigger market opportunities by enabling warranties to be made.